I currently own two motorcycles, a KTM 950 Adventure and a Suzuki DR650. They are both “Dual Sport” or “Adventure” styled motorcycles in that they can handle a wide variety of terrain. The biggest difference between the two besides the obvious displacement differences is that the KTM is an expensive, high maintenance bike and the Suzuki isn’t. I bought my Suzuki DR650 brand new in 2006 and it has been a fantastic machine. I have ridden it all over the U.S., in Canada and Mexico and have never had a single breakdown. Maintenance on this bike has involved new fork seals, front and rear brake pads and regular oil changes and thats about it. Tires can be bought cheaply and insurance is next to nothing, so owning this bike requires very little effort and a big reward. While the Suzuki is underpowered and has mediocre suspension, it is still a hoot to ride. I can take that bike through nearly anything, from single track trails to interstate highways and still get 50mpg. The KTM on the other hand is quite different. The Austrian made motorcycle sold for over 13 thousand dollars new and has almost 100 horsepower. The liquid cooled V-twin motor supplies a nearly endless supply of horsepower and its Slovenian made Akrapovic Titanium mufflers create an amazing sound. This motorcycle is all about passion, it excites the senses and almost always leaves a smile on your face, that is until you have to work on it. The KTM is a maintenance hog and a rather complicated machine which requires expensive oil and premium gas and plenty of time to work on. When you own a 100 horsepower motorcycle, you have to have good tires and even better insurance, which can be pricey for something with that many CC’s. The KTM has a lot of known issues also, including a poorly designed water pump, fuel pump, clutch slave cylinder and many other issues that need to be addressed to make it a reliable bike. Fuel goes through this thing at an amazing rate, making it about as fuel efficient as your average compact car. So, you are thinking, why would anyone want something like this? Well, its passion. The KTM is an animal, its overkill in every sense, its like using a sledgehammer to pound in a nail. Its Dakar Rally based looks and rumbling motor make grown men drool and this suspension make it handle beyond belief. 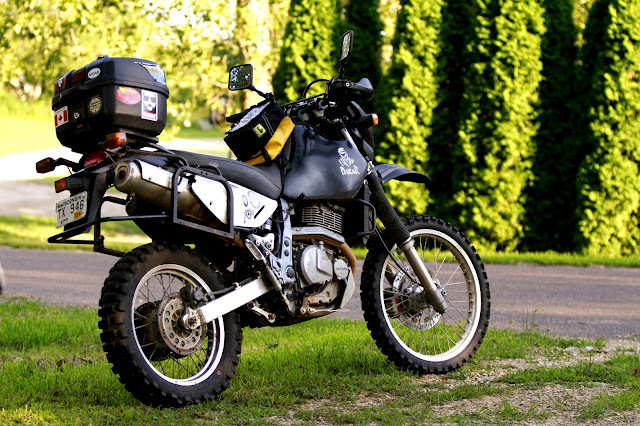 There is nothing cool about a Suzuki DR650, its fun to ride but nobody really gets excited about them unless they own one as well. The Suzuki is all you need really, and it’s always going to get you home. The biggest benefit is that it costs next to nothing to explore on this bike, which will free up a lot of extra money, which in turn frees up a lot of time. So does the thrill of the ride overcome the hardship you have to endure to own a fancy adventure bike?